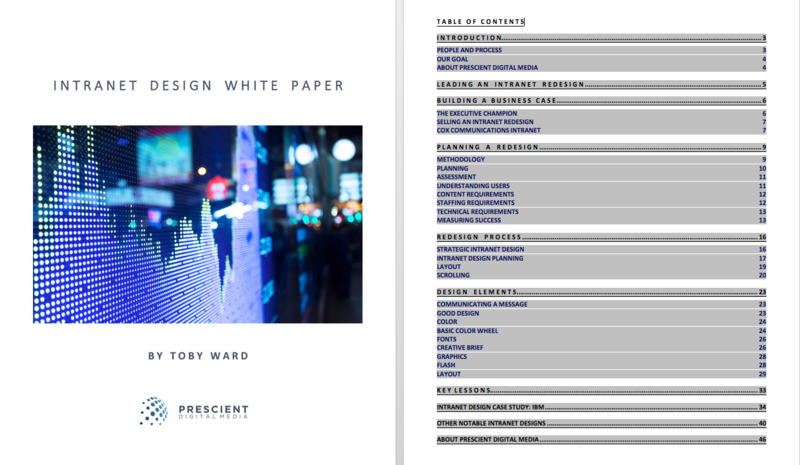 This complimentary, 47 page whitepaper contains numerous best practice recommendations and considerations for transforming your intranet design into one that is engaging, easy-to-use and visually appealing. Undertaking an intranet design or intranet redesign project can be a challenging, but extremely rewarding task, when all the right steps are taken. Creating a strong, dynamic, visual identity requires more than the right colors and fonts - it requires proper planning, senior executive sponsorship, and input from users and key stakeholders. This whitepaper is an essential resources for all intranet managers and consultants, particularly in communications, HR and IT. Design is frequently cited by employees as the thing they hate most about their intranets - but few people understand the planning and process required to truly deliver results when undertaking a redesign project. Too often, intranet design projects spiral out of control, resulting in an endless cycle of design iterations, which waste time and money. Senior executives are results-driven, and want to ensure they are getting the biggest "bang for their buck" when funding redesign projects. Intranet managers are under more pressure now than ever before to show the true value of a redesign project, and the ROI associated with it. Many organizations perceive intranet usability problems to be the result of a flawed design, when really the problem lies in the structural foundations of the design, namely information architecture and wireframes. Identifying the right qualities to look for when picking a leader (executive champion) for your intranet design campaign. Building a business case for the redesign project by demonstrating how it can streamline business processes, reduce the cost of internal business functions, and enhance communications and collaboration between employees, managers, suppliers and other users. Conducting Assessment and Planning before undertaking an intranet redesign project, so that you truly understand your users' wants, needs and desires. Recommendations for information architecture, page layout and design elements. Creating a Creative Brief to manage the graphic design process. The importance of a creative brief to ensure the design elements of the new intranet are documented and approved before proceeding (e.g. color palette, fonts, images / photos, iconography, technical limitations). Prescient's own position on frequently-debated design best practices such as optimal white space to text ratio, and scrolling on the home page.